We have had a thief in the night. I believe a raccoon has the belief that we should supply him with nightly meals. It has killed 2 chickens and has been cleaning out the dog and cat feed in the horse barn. We suspected something last week but it is now confirmed. We found one of our hens killed in the coop this week. The darn raccoon was climbing up pipe fence to the metal roof in order to climb in a vent. In all of our efforts to secure the coop, the little thief found the one weak point. We never expected anything to come up from the fence. Due to the dew on the grass and a few dirt patches we were able to track its movements along the fence and onto the roof.. In the barn, we have been putting our bags of feed into an animal carrier to secure them at night. The raccoon has been reaching in and trying to pull the bag through the door grate. In doing so, it has been pulling about 25 lbs. around the floor. That feat has matched the size of foot prints found on the fence. We are dealing with at least one adult maybe more. I am reluctant to deal with the situation with a gun. I feel the power of any gun that I have will be too much around the buildings and other animals. I really don’t want to wake up the neighbors, or draw suspicion to our farm. I have too many cats to use any trap including a live trap. And I really don’t think he will leave just by asking . So, I have purchased an air rifle to use to deal with our thief. Now the hunter becomes the hunted. Tonight I will be ready. I am on farm protection duty! We have been spending all of our free time getting our “to do” list knocked out. Our focus on growing the scope of our farm has added a lot of work this summer to our list. With a lot help from my parents, we are slowly getting caught up. Our main goal this year is to increase the number of revenue streams on our farm. The hard part about adding different revenue streams, is to not spread yourself to thin. There is only so much time in one day. You must not cut your free time too short or you will burn yourself out and the farm will become a drain. Our goal this year is to increase our number of sows, and in doing so we are now producing feeder pigs and fat hogs from different breeds. We were already breeding Ossabaw Island Pigs, so adding a few more litters of babies a month will not over tax our infrastructure or allocated labor. We did need to add more pens and build a few more huts, but we also put in a new alley system to make feeding time run smoother. With the new alley, the time it takes to feed has actually decreased. The alley will also allow us to break one more large pen into three, which will let us better manage our growing herd. 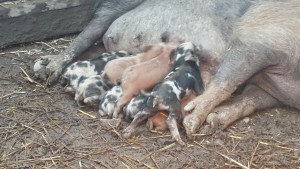 We have farrowed 4 litters of babies this past week. Our new pens and alley made that easier. We did not plan on so many at once, but nature sometimes makes its own plans. Next year we will be scheduling our litters to better coincide with the market. We had times this spring that we sold out of feeder pigs, and we are constantly running a reservation list for Ossabaw Island pig breeders. Our new pens will allow us to keep a surplus so we will not miss any sales. Plus the surplus will lead into another revenue stream already in the works to be implemented some time next year. We have also just about completed our chicken coop. We have been been selling a few eggs, but we will be able to focus more on that. Also with the coop done we will be able to breed 3 separate breeds and a popular egg laying hybrid. The completed coop will allow the farm to increase the number of products that we can sell, which will hopefully draw in a few more customers.